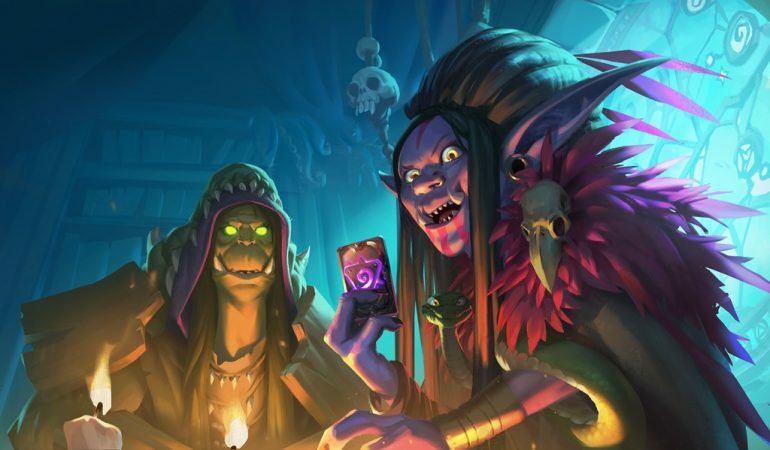 Hearthstone’s Rise of Shadows expansion went live today, and that means it’s time to bust open some packs. Luckily for us, Blizzard are giving players a new quest line that rewards a variety of packs from expansions available in Standard play. Over the next five days, players will be awarded five different quest. Each quest will reward at least two different packs. 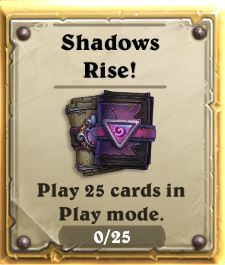 Rise of Shadows launched with a quest rewarding one pack from Rise of Shadows and The Witchwood respectively for playing 25 cards in play mode. Day two of the expansion will reward a Rise of Shadows pack and Boomsday pack for playing five games in play mode. Day three will award a pack from Rise of Shadows and a Rastakhan’s Rumble pack for drawing 20 cards in any mode. Day four should reward a Rise pack and Witchwood pack for winning one game in play mode. Then, finally, day five will end the quest line by awarding a pack from every expansion available in Standard after you play 100 cards in any mode. Be sure to log in each day over the next five days to ensure you don’t miss out on any of these Legendary Launch Quests. This will be a great way to fatten up your collection for Standard after losing so many tools upon entering the Year of the Dragon.